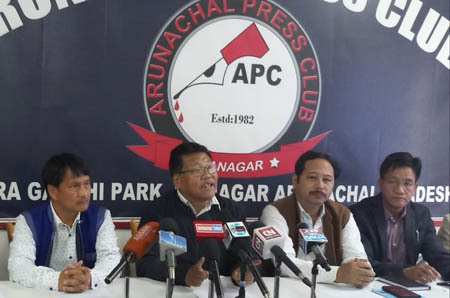 ITANAGAR, Feb 8: The Arunachal Indigenous Tribes Forum (AITF) has expressed serious concern over the alleged inaction of the state government against those involved in the Potin-Pangin Trans-Arunachal Highway (TAH) scam despite submission of the fact-finding committee’s report. Addressing reporters at the press club here on Friday, AITF president Bengia Tolum said the forum had met the chief minister, and submitted a memorandum to the prime minister on 2 February, apprising him of the facts of the TAH scam. “The CM on his part had assured to take legal action against the culprits involved in the scam, but no such action has been initiated so far,” Tolum said. Speaking on the citizenship amendment bill (CAB) issue, Tolum said the AITF had held discussions with the chief minister on Thursday and reiterated its demand to exempt Arunachal Pradesh from the purview of the CAB. “The CAB is an anti-tribal bill and it will badly impact the indigenous population of the state in the long run. It is in contradiction to Section (7) of the Bengal Eastern Frontier Regulation Act, 1873, and should not be implemented in the state at all,” Tolum said. Tolum said non-indigenous people should not be granted APST status, should not be allowed to purchase land, continue to possess ILP, etc, under the Bengal Eastern Frontier Regulation, 1873. He said a proper legislation to this effect should be passed in the state assembly to protect the indigenous population. He also questioned the silence of the state’s three members of parliament over the controversial issue. “They have miserably failed the people of the state and have not properly represented the sentiments, hopes and expectations of the people. We, however, hope that the prime minister will focus on these burning issues during his visit to the state,” Tolum said.